Do you want to know how stupid my co-blogger Matt Wedel is? Having already discussed the ostrich Struthio camelus in Wedel et al. (2000b), that total idiot went on to misspell the trivial name as “camellus” in Wedel and Cifelli (2005:52). What a doofus. And do you want to know how dumb my other co-blogger Darren Naish is? Throughout Naish and Dyke (2005), he consistently misspelled the species name of Elopteryx nopcsai as “nopscai“, despite extensively discussing Nopcsa, who the species was named after. What a moron. It’s a good thing I would never do anything so stupid. 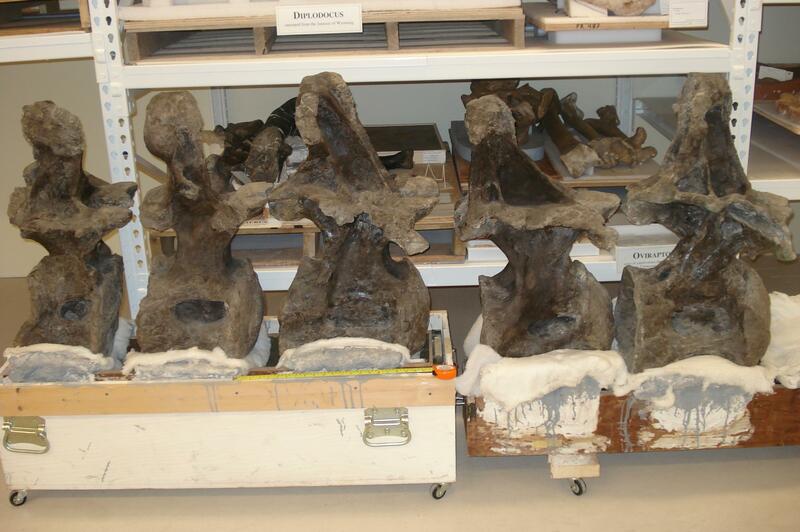 Brachiosaurus altithorax holotype FMNH P25107, last five dorsal vertebrae in right lateral view. Photograph by Phil Mannion. So I have this paper in press about the two “Brachiosaurus” species and how they are not really congeneric — I think we’ve mentioned it a few times. It’s now very nearly a year since I submitted it, under the title: A re-evaluation of Brachiosaurus altithorax Riggs 1904 (Dinosauria, Sauropoda) and its generic separation from Giraffatitan brancai Janensch 1914. And now — now, a year on, after having re-read this manuscript some insane number of times — I finally notice my own grotesque error: Riggs of course named B. altithorax in 1903. Argh! So in the last few days, I’ve spent some crazy amount of time going through and changing this title in my dissertation (where it pops up as Chapter 2), in my CV, in my on-line publications list … and of course, making a GIGANTIC sign in flashing red neon, to be suspended before my eyeballs at all times, reminding me to fix this in the page-proof when that turns up. So the moral of the story is: we are idiots. Naish, Darren and Gareth J. Dyke. 2004. Heptasteornis was no ornithomimid, troodontid, dromaeosaurid or owl: the first alvarezsaurid (Dinosauria: Theropoda) from Europe. Neues Jahrbuch für Geologie und Paläontologie Mh. 2004(7): 385-401. Taylor, Michael P. In press. A re-evaluation of Brachiosaurus altithorax Riggs 1903 (Dinosauria, Sauropoda) and its generic separation from Giraffatitan brancai (Janensch 1914). Journal of Vertebrae Palaeontology. Taylor, Michael P., Mathew J. Wedel and Darren Naish. In press (2009). Head and neck posture in sauropod dinosaurs inferred from extant animals. Acta Palaeontologica Polonica 54(2). Wedel, Mathew J., and Richard L. Cifelli. 2005. Sauroposeidon: Oklahoma’s native giant. Oklahoma Geology Notes 65(2):40-57. Mathew J. Wedel, Richard L. Cifelli, and R. Kent Sanders. 2000b. Osteology, paleobiology, and relationships of the sauropod dinosaur Sauroposeidon. Acta Palaeontologica Polonica 45(4):343-388. The royal mail published a set of dinosaur stamps to celebrate 150 years of Owen’s term ‘dinosauria’ only for Hugh Torrens to point out that it was actually a year out. That’s too funny. Everyone knows that B. altithorax was named in 1904! You silly geese. Now, personally, I’m very excited about your neutral posture paper. I read the abstract at Acta Palaeontologica Polonica. We’ll be talking about the paper in detail RSN. Please hold fire till then. For now, we need to concentrate on … uh, how stupid we are. How about having “Cretacreous” (in my 1994 tyrannosaurid paper in Journal of Paleo), or “hellene” for “hellenae” in the Holtz & Osmolska Saurischia chapter in Dinosauria II? Excellent! I don’t often get to say this when not functioning as a reviewer of 1950s cartoons, but: it turns out that Tom and Jerry are idiots, too! Anyone else have a confession they want to unload? Well, yes. My own first paper (never mind the coauthor) – Systematic Biology, impact factor of up to 10 – proudly assigns the frog Baurubatrachus to the Campanian because that’s what the ancient amphibian literature did (and I do mean ancient amphibian literature, not just ancient-amphibian literature), and then proudly goes on to conclude that the bufonid-hylid divergence is the only dated divergence in the tree for which the date is congruent with the molecular estimate. Hello? Bauru? It’s from the Marília Formation, as at least one of my sources states plainly. I knew full well that’s Maastrichtian. To sum up, I’m too stupid to read. What’s the citation for Riggs 1903, actually? Surely it’s not the same paper that sinks Brontosaurus into Apatosaurus? Riggs, Elmer S. 1903a. Brachiosaurus altithorax, the largest known dinosaur. American Journal of Science 15(4), 299-306. Riggs, Elmer S. 1903b. Structure and relationships of opisthocoelian dinosaurs. Part I: Apatosaurus Marsh. Field Columbian Museum of Geology 2: 165-196. I spelt Mastigophora wrong throughout the whole of my dissertation and only noticed when it came to the viva and saw the corrections on the paper. You’d think I’d get it right having discussed the thing extensively and read umpteen papers, and looked at several specimens of the thing. Ah, so it’s not the same paper, and it really is 1903 nonetheless. Thanks. BTW, I think the blame is misplaced here; isn’t it the role of the editors and peer-reviewers to render omniscient opinions on errors in the paper? Surely, THEY are the idiots. Right? True story: One of the SVP posters I was a co-poster-er on was done fairly last-minute (ok, all of them were, but we’re making fun of my errors here, not my scheduling ability!). We sent it out to a colleague to have it proofed at the last minute, and sure enough it came back with a large number of homonyms and grammatical mistakes of the type that result from late-night editing. As a joke, in our acknowledgments where we thanked the reviewer we used every homonym and grammatical error we could muster. We all had a laugh at our cleverness, but when I showed up to defend the poster one coauthor’s advisor (who shall remain nameless but takes spelling *very* seriously) was there, shaking his head at the coauthor and providing verbal reprimand. That’s nothing. NHM signage here misspells the renowned Othniel Charles Marsh’s first name as ‘Othneil’. Or at least it did on the 5th of May 2008 when I was last there. In the typographer’s favour, I believe the names of the dinosaurs this sign credits Marsh for naming are spelt right.